On Thursday, the bench, led by Chief Justice JS Khehar, pronounced a unanimous judgement even if the judges had slightly different arguments as to how privacy is intrinsic to right to life and liberty. The bench comprised Chief Justice Khehar and Justices J. Chelameswar, SA Bobde, RK Agrawal, Rohinton Nariman, AM Sapre, D.Y. Chandrachud, Sanjay Kishan Kaul and S. Abdul Nazeer. In its 547-page judgment that declares privacy to be a fundamental right, the Supreme Court has overruled verdicts given in the MP Sharma case in 1958 and the Kharak Singh case in 1961, both of which said that the right to privacy is not protected under the Indian constitution. The judgment includes within it six separate judgments from different judges, though the conclusion is unanimous. The Wire has broken the main judgment into its constituent parts to make it easier to see what the different judges said. The judgment also included a two-page final order, which states that MP Sharma and Kharak Singh are overruled, and the right to privacy is fundamental. 1 The judgment in M P Sharma holds essentially that in the absence of a provision similar to the Fourth Amendment to the US Constitution, the right to privacy cannot be read into the provisions of Article 20 (3) of the Indian Constitution. The judgment does not specifically adjudicate on whether a right to privacy would arise from any of the other provisions of the rights guaranteed by Part III including Article 21 and Article 19. The observation that privacy is not a right guaranteed by the Indian Constitution is not reflective of the correct position. M P Sharma is overruled to the extent to which it indicates to the contrary. 2 Kharak Singh has correctly held that the content of the expression ‘life’ under Article 21 means not merely the right to a person’s “animal existence” and that the expression ‘personal liberty’ is a guarantee against invasion into the sanctity of a person’s home or an intrusion into personal security. Kharak Singh also correctly laid down that the dignity of the individual must lend content to the meaning of ‘personal liberty’. The first part of the decision in Kharak Singh which invalidated domiciliary visits at night on the ground that they violated ordered liberty is an implicit recognition of the right to privacy. The second part of the decision, however, which holds that the right to privacy is not a guaranteed right under our Constitution, is not reflective of the correct position. Similarly, Kharak Singh’s reliance upon the decision of the majority in Gopalan is not reflective of the correct position in view of the decisions in Cooper and in Maneka. Kharak Singh to the extent that it holds that the right to privacy is not protected under the Indian Constitution is overruled. (I) Privacy has both positive and negative content. The negative content restrains the state from committing an intrusion upon the life and personal liberty of a citizen. Its positive content imposes an obligation on the state to take all necessary measures to protect the privacy of the individual. 4 Decisions rendered by this Court subsequent to Kharak Singh, upholding the right to privacy would be read subject to the above principles. 5 Informational privacy is a facet of the right to privacy. The dangers to privacy in an age of information can originate not only from the state but from non-state actors as well. We commend to the Union Government the need to examine and put into place a robust regime for data protection. The creation of such a regime requires a careful and sensitive balance between individual interests and legitimate concerns of the state. The legitimate aims of the state would include for instance protecting national security, preventing and investigating crime, encouraging innovation and the spread of knowledge, and preventing the dissipation of social welfare benefits. These are matters of policy to be considered by the Union government while designing a carefully structured regime for the protection of the data. Since the Union government has informed the Court that it has constituted a Committee chaired by Hon’ble Shri Justice B N Srikrishna, former Judge of this Court, for that purpose, the matter shall be dealt with appropriately by the Union government having due regard to what has been set out in this judgment. 6 The reference is answered in the above terms. 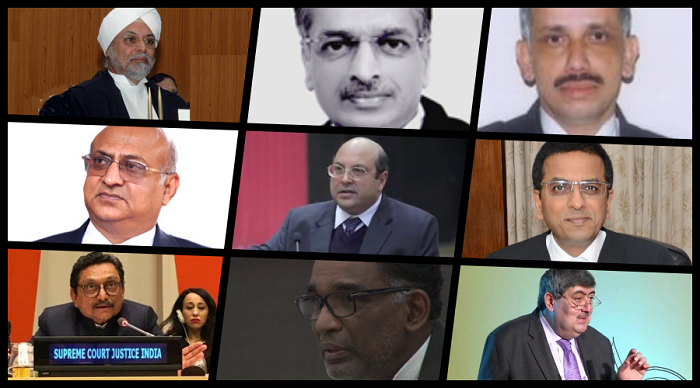 Justices Chelameswar, Bobde, Nariman, Sapre and Kaul delivered independent judgments, all in concurrence. The petitioners, former Karnataka high court judge Justice K.S. Puttaswamy and others, had contended that the biometric data and iris scan that was being collected for issuing Aadhaar cards violated the citizen’s fundamental right to privacy as their personal data was not being protected and was vulnerable to exposure and misuse. Arguments on behalf of the petitioners were made by senior advocates Gopal Subramanium, Shaym Divan, Sajan Poovaya, Arvind Grover and Indira Jaising, and former attorney general Soli Sorabjee. The petitioners had argued that right to life under Article 21 of the constitution would include the right to privacy though it is not expressly stated in the constitution. It was also argued that privacy is a broader concept and data sharing is only one aspect of privacy. Subramanium had argued, “Privacy is about the freedom of thought, conscience and individual autonomy and none of the fundamental rights can be exercised without assuming certain sense of privacy”. Sorabjee had added that “Privacy is not explicitly laid out in the constitution. But that does not mean the right does not exist as it has be deduced from the constitution”. He also argued that the freedom of the press has been derived from Article 19 and similarly, the right to privacy can be derived broadly from Article 21. In the age of the internet, a person should have control on how much he should put forward and not be compelled. There hardly exists any data protection in the digital age, inevitably leading to a compromise in privacy. During the course of arguments, it was brought to the court’s attention that Union finance minister Arun Jaitley, during discussions in the Rajya Sabha on the Aadhaar Bill in March 2016, had said that the right to privacy was a fundamental right, but now the government is claiming the opposite. Subramanium had said, “Privacy is a broader concept and data sharing is only one aspect of privacy. Privacy is about the freedom of thought, conscience, and individual autonomy and none of the fundamental rights can be exercised without assuming certain sense of privacy”. He added that the state is under an affirmative obligation to protect the fundamental rights of citizens. He said, “Liberty existed prior to constitutional era and the law had merely recognised its existence. Liberty, which is fundamental to democracy and citizens, cannot exist without privacy”. On behalf of the Centre, attorney general K.K. Venugopal, however, had brought to the notice of the court that an eight-judge bench in 1954 and a six-judge bench in 1962 had categorically ruled that the right to privacy was not a fundamental right. He also said that such a right had not been expressly provided in the constitution, though under the British Common Law, the right to privacy was a fundamental right. He maintained that the right to privacy is not a fundamental right to be claimed either under Article 21 (right to life), Article 14 (right to equality) or Article 19 (freedom of speech and expression). It was asserted that the concept of privacy is a notional one and not a fundamental right enshrined in the constitution. He claimed that privacy is too vague to qualify as a fundamental right. He had said that there is no right to privacy and that privacy is only a sociological notion, not a legal concept. “Every aspect of it does not qualify as a fundamental right, as privacy also includes the subtext of liberty. No need to recognise privacy as an independent right. Defining the contours of privacy is not possible. Privacy is as good a notion as pursuit of happiness,” he had said. Venugopal said, “If privacy were to be declared a fundamental right, then it can be a qualified right.” He asked the judges to state that only some aspects of privacy are fundamental, not all, and it is a limited fundamental right that can be taken away in legitimate state interest. He said that in developing countries, something as amorphous as privacy could not be a fundamental right, that other fundamental rights such as food, clothing, shelter etc. override the right to privacy. The attorney general also made clear that the right to privacy cannot fall in the bracket of fundamental rights as there are binding decisions of larger benches that it is only a common law right evolved through judicial pronouncements. “The government said Aadhaar would not fall under the right to privacy. We can’t say every encroachment of privacy is to be elevated to fundamental right. The claim to liberty has to subordinate itself to right to life of others,” he said. On Aadhaar, he referred to the World Bank’s statement that an identity system should be followed by every developing country.